The Muse Writers Center has grown from its humble beginnings in a basement with one poetry class to a full service independent writing center, offering 60 classes a semester, with 40 active teachers and serving over 1,000 registered students! 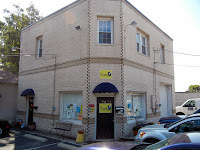 Located in Norfolk, Virginia, The Muse is a 501c3 non-profit corporation, providing a creative home for writers of all ages and experience. From poetry to fiction, erotica, magazine writing, new media, reading for writers, ukulele, cookbooks, standup comedy and classes for teen writers, each of their three yearly semesters offers an diverse variety of courses. Dedicated to broadening community awareness and support of the literary arts, founders Michael Khandelwal and Lisa Hartz kindly agreed to answer a few questions for Poets’ Quarterly about how The Muse began, how it has grown and how it continues to thrive. MBA: Can you describe how The Muse came to be? Michael: When I moved back to Virginia after being in Los Angeles for 13 years, I soon started to miss teaching. I approached a friend of mine who owned the Ghent Studio of Fine Art (SOFA), and asked if I could offer a poetry workshop there. She said that they’d tried it before, and it didn’t work.. .but I was welcome to try again. I made my own fliers and pasted them around town and got six students. That first class was a big success, and we had a reading afterward. The next session, I offered two levels. Then, for the summer 2005 session, I offered three. By that time, I had met Lisa in one of my classes, and she was interested in teaching memoir, and I wanted to teach fiction, too. But, at the same time SOFA went out of business. So, Lisa and I started The Muse Writers Center, by drawing a logo on a napkin. Lisa: After the poetry class we used to go to a local pizza place for beers. I asked Michael what he thought about maybe me teaching a class – and had he ever heard of a place called The Writers’ Center up near DC? It’s one of the original literary centers, like The Loft in Minneapolis. A tremendous resource for local writers. I told Michael I thought we could do something like that here. What were the first few years like? Michael: Great. A lot of learning… often by trial and error, but the great thing about being independent is that you can make mistakes and correct them quickly. Lisa: The growth was slow and steady. . . It had to be – it was only the two of us running it Teachers found us, or Michael met them somehow, and I’d sit with them and develop a course that they were excited to teach – that built on their strengths and passions as writers. . . .About five years in, things sort of exploded – we suddenly went from offering maybe 15 classes to 20, then 40. What partnerships/advice helped formulate the structure? Lisa: We did a couple of really smart things, I think, in the beginning. We listened to our students – asked them what they were interested in – and did our best to find a teacher for that class. Then we listened to the teachers, asked them what their passions were and letting them design their own courses. We made it clear that there was no Muse aesthetic. It helped that Michael and I were absolute beginners with no illusions about knowing what we were doing. What are the key components of a Muse event or class? Michael: Well, they are two different things. For classes, they are all molded on the MFA model of workshops, but we vary it by offering introductory, intermediate, advanced, and professional levels. The expectations are different in each level. For our intro classes, we are very interested in helping a writer find and strengthen their voice and their craft–as well as their workshopping skills. For events… for readings, we just want to celebrate our students and the work they’ve produced in the previous sessions’ classes. For our parties like the Summer Solstice Open House, we like to build bridges with the community and our students, all while having a great time! What was your original goal in starting The Muse? Lisa: It was really important to both of us that the classes be affordable – that no one ever be turned away for lack of ability to pay. We kept our tuition low and offer a tuition-assistance program. The ultimate goal was to create a real community based on a common interest in literary pursuits unimpeded by the usual social barriers of income or class. What classes do you currently offer? What poetry classes? Lisa: We’ve had some fantastic poetry classes on special topics: the short poem, the formal poem, ekphrasis. We’ve just done one on the theme of exile in poetry, and we’re offering one this fall called “Writing Across the Lines: Poetry Exploring Race, Culture and Ethnicity.” Very excited about that one. Michael: We invite visiting poets to teach classes… these are usually people associated with the universities in the region. 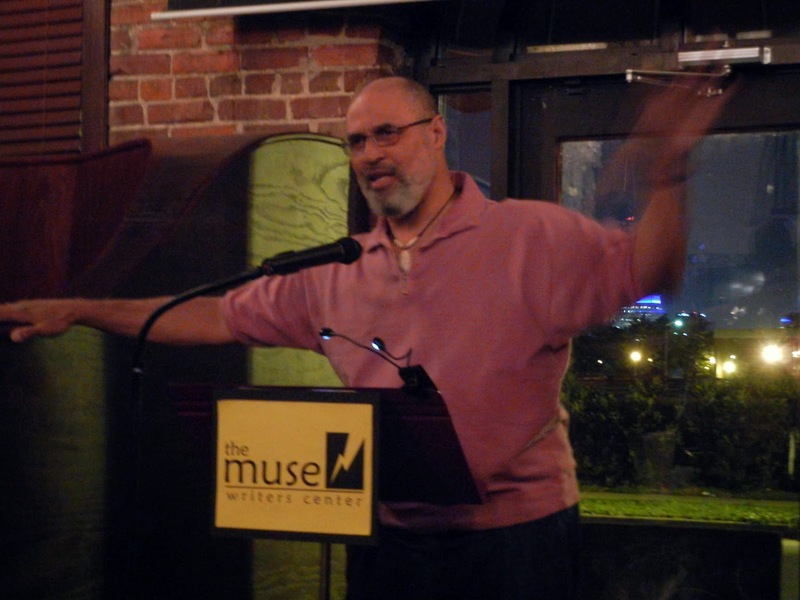 Tim Seibles recently had a great workshop on The Short Poem. The most successful poetry classes have seemed to be the ones where we bring in renowned poets in an effort to reach people who aren’t in the university… I’m thinking of Luisa Igloria, Remica Bingham, Renee Olander, etc. What freedoms do you have that a university or college does not? Lisa: No grades! Plus, we can be responsive to our community as it grows and changes. Michael: We can offer classes without committees. We can try something out and see if it works. Many of our teachers who teach in MFA programs are happy to offer classes that they wouldn’t be able to offer at the university. Lisa: Money. We’d love to have a larger facility that could be open all the time. Plus, we could take even more chances on experimental courses if we didn’t have to worry about income. How important has it been to have such a strong partnership? Michael: I build partnerships in the community with other nonprofits and organizations. I deal with students, teachers, and most of the business side of the operation. Lisa: I develop the courses and recruit teachers. I design the course schedule – we have three sessions a year. I’m faculty liaison – I deal with any problems that come up in classes or with students. I also do community outreach projects, working with local arts organizations and other non-profits on projects that are a benefit to us both. What one activity typifies The Muse? Lisa: I’d have to say that our readings are what keep me going when The Muse seems to be eating my life. Our readings are celebrations – a kind of graduation at the end of each session. They are held at area restaurants. I go to the readings and look around at these tables full of people who have nothing obvious in common – these people who would otherwise never have met – but they all love to write and are here to support one another. It’s a beautiful thing. What was your happiest Muse moment? Michael: There are so many, I can’t think of just one. The day we got our nonprofit status in 2006 was a great one. The day my first student got an agent was great. For me, I often leave the classes I teach feeling elated. We have a lot of extremely talented writers/students! What was your most anxious Muse moment? Lisa: We’ve been homeless a couple of times, but some generous person or organization always came through just in time. Michael: The various times I’ve had to give up a class to a new teacher so I wouldn’t be working 100 hours a week! I started by teaching an intro poetry class… so in some ways, everything goes back to that first class at SOFA. The poet Ethelbert Miller said, “When you rise each morning vow to fix something that is broken. The repair begins with your heart.” What are you repairing? Lisa: The Muse has repaired many writers who have been damaged by insensitive teachers. Many times I have been told that a teacher told a beginning writer to give up, that the talent wasn’t there. It can and has taken people decades to get over this. We’re here for them when they’re ready. Michael: I don’t know if we repair anything. I think we expand. I think we take people who have a desire to express themselves and give them the opportunity to practice and learn. I don’t like to think of it as something being broken in someone… but instead of stoking the flames of people’s desires to express themselves through the art and craft of writing. What advice would you give to other people who are thinking of starting an independent writing center? Michael: It’s a great way to build community. There are so many areas in the country that don’t have literary centers… and they’d be great additions to your town! Start small. Let it grow. Tackle one thing at a time, and get good at it before you move to the next thing. Lisa: Do not try this alone. Definitely find yourself a business partner whose talents and abilities complement yours. Do not expect to make any money for a long time. Study your community – who’s there who can help you? Accept help. Lisa: We’re looking forward to expanding our relationships with area arts and social organizations, such as our local university’s LitFest. We’re working on our budget, looking for a long-term plan to move into a larger facility so that we can continue to expand our offerings. Michael: Hopefully in the next year or so, a new, larger space. We are starting to overflow where we are. One thing I really like about The Muse Writers Center is that we address many different aspects of the art of writing. I am a big believer in being interdisciplinary in one’s training. If you want to be a fiction writer, take some poetry classes… they’ll help you with the power of words and the musicality of language. That’s why I like that we offer so many genres of writing. Screenplay can help with structure and plot. Improv can help with character, setting, and scene. Memoir can help with finding the personal in your writing. Sometimes people forget that when “literature” started, we had drama/tragedy and we had comedy. Life–and good writing–acknowledges both sides. The Muse seems to play a major role in the Norfolk community. How has this contributed to your success? Lisa: We have an MFA program at our local university, Old Dominion, which has provided us with quite a few recent graduates who are ready and excited to teach creative writing. This area is very supportive and passionate about the arts, and we’ve been welcomed from the start. We’ve formed a great partnership with the Museum of Contemporary Art in Virginia Beach which is thriving. A local charity, The Up Center, has also partnered with us for an event. How has friendship helped to maintain the writing center? Lisa: Michael’s and mine? Because honestly I think the friendship that has developed out of working together can sometimes get in the way. Sometimes we have to think like business people, which can make for some difficult conversations. The mutual respect that we have as friends does pull us through. If The Muse had a motto, what would it be? Lisa and Michael: Write where you are! Is there anything I didn’t ask about that you would like to discuss? woven on the green fuse box? has moved on too fast, regrets. 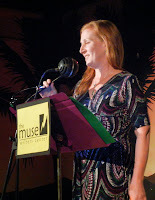 Lisa shares one of her poems, written at The Muse. between his knees, and the piano notes were sugar cubes. sailing over the Potemkin steps. The August street silent at just dusk. The deepblue slanting light is humming. Yes, I said. I see. At the harbor, salt ships and yellow sky. Don’t look, he said, enter. 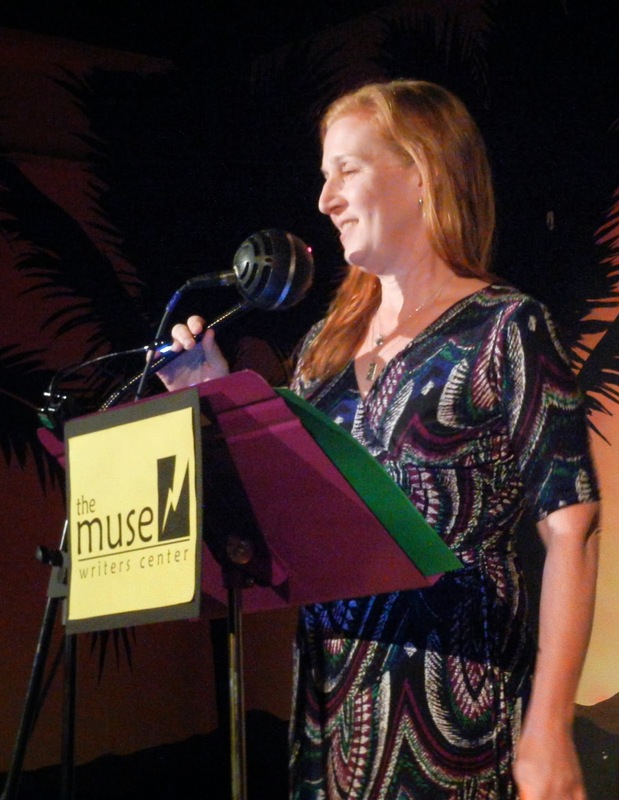 Lisa Hartz earned an MA in English Writing from Hollins College and an MFA in Creative Writing from the University of Miami. Her work has appeared or is forthcoming in PoemMemoirStory, Poet Lore, Subtropics and other publications. She lives with her husband and four sons in Portsmouth, Virginia. Michael Khandelwal writes for Hampton Roads Magazine. He has also worked for Portfolio Weekly and The American Council on Education. He earned a Masters in Professional Writing from USC. While in Los Angeles, he worked in film and radio while teaching neuroscience. He is co-director of The Muse Writers Center and was President of the 2008 Virginia Electoral College.